Studley Royal emerged triumphant from their battle with fellow York Senior League Premier Division promotion hopefuls Dunnington, winning the game in dramatic style. In what was an extremely tight contest at Pryers Cricket Ground, Matthew Coad’s side took the game by a single run after bowling their hosts out with the final ball of the day. Earlier, Royal had made their way to a score of 175/9, which included a half-century from James Clarkson (55) and 42 from Rob Nicholson. Dunnington looked well set in reply at 81/1, but three wickets each from skipper Coad (3-23) and William Wray (3-41) helped the visitors back into the game. It was then left to Clarkson to snaffle a caught-and-bowled chance from the game’s last delivery to secure a memorable victory. The result leaves Royal fourth in the top-flight standings, just 13 points behind second place. 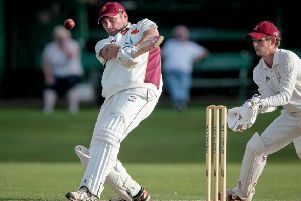 Knaresborough lost their top-of-the-table showdown with first division leaders Sheriff Hutton Bridge 2nds. Dave Girling hit 46 and Sam Ryan 32, but the hosts were dismissed for just 144 and Bridge eased to a five-wicket success despite some useful bowling by Tom Metcalfe (2-11) and Greg Pickles (2-18). Harrogate 2nds leapfrogged Knaresborough in the table and are up to second after centuries from Andy Hawkswell (157) and George Owram (126) helped them take the better of a draw against local rivals Ripon at St Georges Road. Visiting bowler Matthew Morton took three of only seven wickets to fall in the entire match, but was unable to prevent the Roosters from racking up 320/4. With plenty of runs on offer, Ripon’s Rob Taylor (78) and Jake Briscombe (71 not out) both took advantage, but despite their efforts the game reached its inevitable conclusion with the away team only reaching 242/3, meaning that the points were shared. In Galtres Division Two, Pannal continued their recent good form, chasing down Easingwold 2nds’ score of 197/7 to claim a six-wicket triumph. Rob Smith bagged 4-31 with the ball before another excellent knock from Rob Ellis (70) helped the men from Burn Bridge finish the job. Elsewhere, Sam Ward (4-10) and Scott Collins (3-19) combined to great effect as Tadcaster Magnets humbled Hovingham. Lewis Ward’s troops skittled their visitors with only 45 runs on the board, then wasted no time in knocking off the required runs in 12 overs for the loss of two wickets. 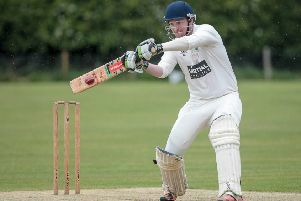 Sessay 2nds got the better of derby rivals Thirsk, recording a six-wicket win away from home. Harry Collinson (67) and Ben Collinson (53) both made half-centuries as the hosts declared on 190/6, James Skelton grabbing 3-28. Mark Jackson (56) and captain Darren Atkinson (45) put on 77 for the first wicket as Sessay responded before 39 from Skelton ensured that the away team left with the bragging rights. Thorp Arch & Boston Spa were beaten by Clifton Alliance 2nds. The visitors compiled a sizeable first innings total of 267/4 and TABS were then bowled out for 177. Niti Kasana struck an unbeaten 53, but his efforts proved to be in vain. Heavy rain meant that Bilton in Ainsty’s encounter with Osbaldwick was abandoned. The York outfit declared having put 272/4 on the board, Will Swires bowling superbly to take all of the wickets to fall. Bilton progressed to 51/0 in response, but the heavens then opened. Knaresborough 2nds made 216/4 against Heworth 3rds in Division Three, however the match ended in a draw due to the bad weather.